A video message from Australia where Rhydian was recently a groom at his best friend's wedding. Happy holidays! Rhydian takes time out from his sound check to send a message to fans from back stage on his current tour with Richard and Adam. A message from Rhydian before he leaves for Wales for what is an important family weekend. A message from Rhydian, whilst on holiday in Mallorca, to fill us in on news of his upcoming album and tours. 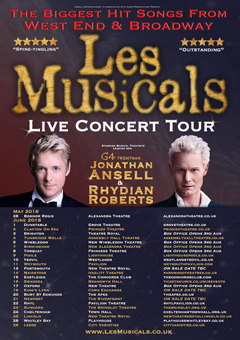 Musical Theatre’s leading men and X Factor stars; Jonathan Ansell (G4 frontman) & Rhydian Roberts join forces for the first time ever to create a dramatic & spine tingling concert. This vocally dynamic evening showcases the smash hit songs from the greatest musicals of all time, brought to you by two of the world's finest voices. All dates and information available on the Les Musicals website and our Live Events calendar. 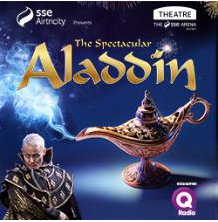 Rhydian to star as Abanazer in Aladdin! Can you think of an album title? Rhydian takes time out from his busy recording schedule to send us a video message. 25 Jun: Late night catch-up with Rhydian! 13 Mar: On the mend! 3 Mar: Autumn Tour News!